Bills are due on the 15th of every month and are considered late on the 16th. When do you disconnect for non-payment? Water may be disconnected any time after the 30th of the month for any past due balance. A non-payment fee of $50 will also apply. Do you charge to turn on after hours? Yes. There will be an after-hours fee of $50 applied to the account and due immediately on all services turned on afterhours that were turned off for non-payment. Do you offer payment extensions? Yes. You are allowed one payment extension in a twelve month period. Learn more about billing assistance. I made my payment, why did I get a late notice? If you made your payment and you received a late notice, please contact our office to make sure that we received your payment. Or you can check your account balance online. Penalties are applied on the 16th, so any payments made after the 15th are considered late and will receive a late fee. When is the last day to pay my bill to avoid disconnection? All balances must be paid no later than the 30th of the month. Balances remaining unpaid after the 30th are subject to disconnection at any time without notice. New invoices do not extend the payment terms of previous balances. No. Any balances unpaid after the 30th are subject to disconnection. See Payment Terms. Do you offer leak adjustments? Can Field Personnel take my payment? No. See more on safety. What is a Hydrant Fee? The hydrant fee is a monthly charge of $3.00 for all water customers. The Commission is required by SCDHEC to meet minimum flow requirements on all hydrants. The fee assists with the maintenance and upkeep of the hydrants and lines in order to comply with this regulation. What is a Setup Fee? The setup fee is a one-time $25.00 charge that will be reflected on the first bill. This fee helps to cover some of the cost associated with setting up the account in the billing system, as well as helping offset the cost of field personnel activities required to start service. What is a Backflow Fee? The Backflow Fee is a monthly fee that covers cost associated with testing and maintaining the backflow device connected to the meter at the service location. 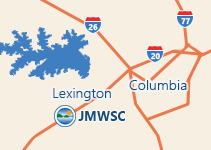 In accordance with South Carolina Department of Health and Environmental Control (SCDHEC) regulations and the Environmental Protection Agency (EPA) guidelines, the Joint Municipal Water and Sewer Commission maintains a Cross Connection Control Program. Through the Commission’s Staff Engineer the Commission ensures that all potential sources of contamination are protected from backflow and back siphonage with properly installed and operating backflow prevention assemblies. This program keeps up with information pertaining to the location, type of device, degree of hazard and test records of all backflow prevention assemblies located on the Commission’s system. Visit our Cross Connection program for additional information. What do you do with the Security Deposit? The full amount of the deposit is retained by the Commission until service is terminated. The security deposit will then be applied to the remaining balance on the account, and any monies remaining will be refunded to the customer. If your name has changed due to marital status simply send us a copy of your Driver’s License with your updated information, or you may stop by the office and present it. Fill out an Add Secondary Form and send back into us with both parties’ signatures and Driver’s License. This can be faxed, emailed, or mailed. How do I remove a spouse or secondary from an account? Fill out a Change Form and send back into us with both parties’ signatures and Driver’s License. This can be faxed, emailed, or mailed. Minimum residual pressure of 25 psi or no less than 20 psi during instantaneous demand such as fire flow. Maximum pressure is only limited by how much the pipe and/or materials are rated. There is no high pressure limit by regulations. Plumbing code requires pressure regulators to be installed on services where pressures from the water distribution system are above 80 psi. There are numerous factors that affect pressures throughout the Commission’s water distribution system, such as: elevation, pump runs, system demands, proximity to elevated storage, etc. Water pressures on the Commission’s distribution system may vary from 25 psi to 170 psi. Due to these possible high pressures, our system is designed and built to withstand pressures of 200 psi. The Commission recommends that you have the pressure tested at your home or business and make the necessary improvements to ensure the internal pressure does not exceed 80 psi. The Commission does not and will not take any responsibility for any damage that may result from high interior water pressures. The Commission recommends that you collect the water in a clean cup or glass without allowing the water to enter the drain. Away from the drain, smell the water in the cup/glass to determine if you detect the same odor. This step will help identify if the odor is in the drain or the water. If the odor is determined to be in the drain, we recommend disinfecting the drain by pouring approximately 2 cups of undiluted bleach into the drain. Allow the bleach to “sit” in the drain (P trap) for at least 15-20 minutes before flushing with tap water. This will allow concentrated bleach to react with the odor causing bacteria in the drain and hopefully solve the odor problem. If you don’t have bleach, use baking soda. Pour about 1 cup of baking soda into the drain, followed by 1 cup of water and let “sit” for 20-30 minutes. These steps may need to be repeated several times to completely resolve the drain odor. The P trap may also be removed from the piping under the sink and cleaned by hand. Products containing bleach and ammonia should never be mixed! It is highly recommended that you flush your water heater. Even if the problem seems to be on a hot and cold water side of plumbing, the common fixtures can be affected. Flush all plumbing lines in the house. Similar to a distribution system, the plumbing lines of a structure should be flushed to encourage the freshest water from the system is in the water line. If it has been a while since you used that fixture, it is a good practice to let the cold water run for 30-40 seconds or until the water is noticeably colder. All lines of concern in the house should be flushed one at a time beginning with the fixture closest to the service ending with the fixture furthest the service. When flushing household lines, you should remove the aerators (screens) from the faucets before flushing to help velocity and remove any debris that may be trapped in the line. If you still need help with any of these issues regarding your water please contact Customer Service at (803)359-8373. What is the pink stuff on my bathroom fixtures? Most pink staining reported by customers is caused by a pink biofilm. Biofilm is typically composed of many different microorganisms and bacteria held together by biological polymers that improve the ability of bacteria to adhere to and proliferate on wet surfaces. Unfortunately, biofilms may never be completely eliminated. So what can be done? Keep it dry. Leaking faucets provide moisture for growth. Keep it clean. Good old-fashioned scrubbing is the best solution. For more information on “pink stain” go to (www.awwa.org). Why is the hydrant running? The Commission maintains an active Flushing Program. The requirement is to scour all distribution mains on an ongoing cycle. Flushing keeps mains clean by removing debris and build up, and is a key function in maintaining high water quality. How can I prevent sewer back-ups? Never pour fats, oils or cooking grease down the sink or garbage disposal. Pour excess grease into a container with a tight fitting lid and dispose of in your household garbage. Wipe the remaining grease from the pan with a scraper or paper towel. Place baskets/strainers in sink drains to catch food scraps and other solids, and empty into the trash for disposal. Place food scraps in appropriate waste containers rather than into the drain or garbage disposal. More information on our “FOG” program. A Boil Water Advisory is issued in some cases where there has been a disruption in water service. As a safety precaution we advise customers to boil ALL water used for drinking and cooking for a minimum of two minutes, until further notice. This is a safety precaution only, and does not mean that the water is contaminated. Water will be sampled and tested within 24hours, and you will be notified when there is no longer a need to boil your water. If you ever have any questions about your water please contact our Customer Service Department at 803-359-8373. What can be flushed in the toilet? How is my water disinfected? The Commission purchases its water from the City of West Columbia which uses Chloramines as its method of disinfection. Read the Chloramines Fact Sheet for for information.